History: DAT Wallonie was formed on September 11 1990 by Sabena (49%), DAT (16%), Meusinvest (25%) and Mutual Company of Public Administration (10%) to stimulate regional flights from Liège-Bierset. 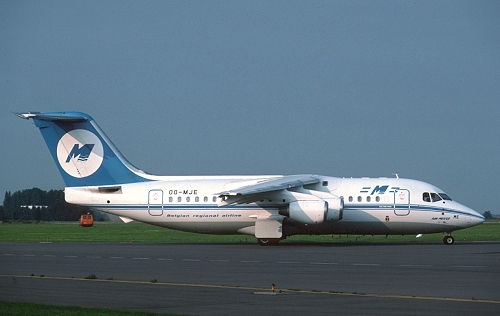 The operating name became Air Meuse and they owned two airframes: an Embraer Brasilia and a BAe146. Both received a color scheme based on DAT, but as these airplanes only flew for Sabena from its Brussels base, they ended up in the colors of the Belgian flag carrier and the project was cancelled on August 21 1997.